Rulers from different communities have left their impressions in India in the form of their royal palaces. They made luxurious palaces and imbibed quite a bit of the west in their preference. Many royal palaces in Gujarat are furnished with state-of-the-art amenities to give them a modern touch with western sensibilities while not compromising on native details. 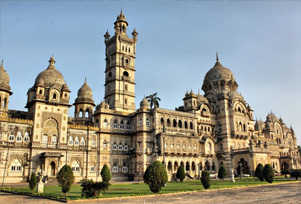 Vijay Vilas Palace in Bhavnagar, Aina Mahal (Old Palace) and Prag Mahal in Kutch, Kusum Vilas Palace and Prem Bhavan Palace in Chotta Udepur, Navlakha Palace, Riverside Palace, Orchard Palace in Gondal, Dolat Nivas Palace in Idar, Laxmi Vilas Palace in Vadodara, Nilambagh Palace in Bhavnagar are known palaces of Gujarat. Maharajas of Gujarat used to love of vintage motorcars and many had their residences in Europe, leaving the administration of their state to Dewans. Some palaces in Gujarat are still the residence of royals while other are converted into a museum or have established a museum and made accessible to locals and tourists. Visit palaces of Gujarat and experiencing the fascinating heritages of India.